2. Heat oil in pan. Fry onion and celery for 5 minutes or until soft. 3. Add mushrooms, garlic, salt, pepper, nutritional yeast and thyme to the pan, and cook for a further 10 minutes. 4. Add soy sauce and cook for a further minute before removing pan from heat. 5. Sprinkle flour onto work surface and roll out pastry into 2 rectangles (each approx. 10cm high x 30cm wide). Trim edges with a knife for straight sides. 6. Spoon mushroom mixture into the bottom half of the first pastry rectangle, leaving a 1cm gap from the side and bottom edges. 7. Brush a little almond milk along the edges. 8. Fold the top half of the pastry over to meet the bottom edges and press down along the edges with your fingers. 9. Press down with a fork along the side and bottom edges. 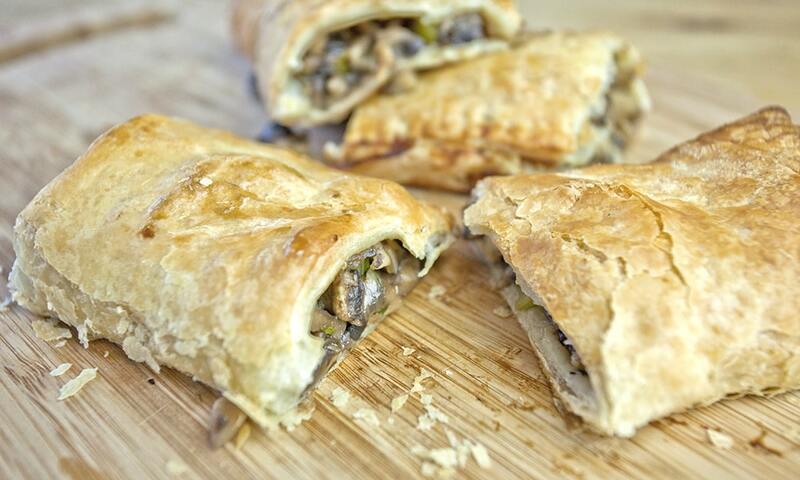 Using a knife, create 3 small incisions in the rectangle, dividing it evenly into 4 mushroom rolls. 10. Repeat steps 6 to 9 for the second pastry rectangle. 11. Brush the top of the rolls with almond milk and bake in oven for 20 minutes. 200 degrees? I’m guessing that’s Celsius and not farenheit. Thanks for clarifying. I really don’t like celery, what would you recommend instead? This looks amazing! Are these freezable? or can you recommend any quick and easy recipes like this i can make in bulk and freeze? Hi Kim, We haven’t tried freezing them but I think it should be OK. Once you’ve finished making them cool them completely, then layer between parchment paper, place in an air-tight container and finally place in the freezer. I’m not a great cook but I followed this and they were lovely. Also I did freeze them. I’m taking them out two at a time and they are just as gorgeous after defrosting and don’t take long. What kind of pan is that!? I finally found a store selling the puff pastry. These are fabulous! My boys don’t like it too spicy so I halved the amount of pepper. The vegetables were sauteed in water instead of oil for mine. Thank you for sharing. I like this mushroom rolls recipe. Thank you.